Included in Designs by Dru's current work are beaded necklaces, shown here. The necklaces are strung with semi-precious stones incorporating amethyst, lapis lazuli, malachite, turquoise, hematite, onyx and jasper. 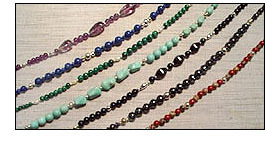 In addition to offering standard length beaded necklaces, Designs By Dru welcomes custom orders for individual needs. 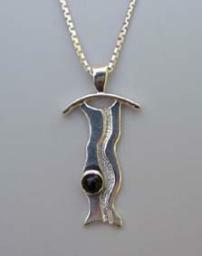 Custom orders are welcome for all of Dru's jewelry designs. If you are already familiar with her work, you may recall having seen a unique pair of earrings, one of her beautiful bracelets or a fun toe ring that is not photographed here. Dru also enjoys creating rings for couples uniting their relationship.